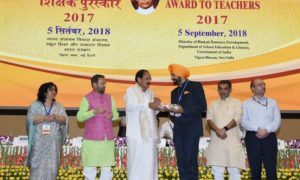 After a dip-search in the ocean of technological development that has of late created a deluge in the educational sector, every shore of academics has been noticeably found to be swept away by the tide of m-Learning and its takeover on the modern day teaching techniques. Astudent, if caught using a mobile phone inside a classroom, can easily set the teacher's blood pressure high and make parents take rounds of the principal's room a couple of times. But what if the teacher himself asks the student to do his lessons on mobile phones while playing and award marks instead of canes? Although sounds weird, but a situation like this can soon be a reality with the onset of m-Learning. The chalk-and-talk learning process in no time can be a history with the implications of the latest technologies in the field of education. Your device can vary from simple mobiles to smart phones to PDAs to iPODS to mini notebooks to net books or whatever comes to one's mind. 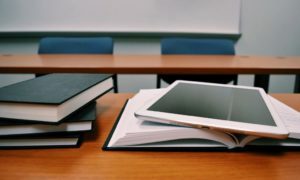 Mobile learning involves connectivity for downloading, uploading and/or online working via wireless networks, mobile phone networks or both, and linking to institutional systems. m-Learning is convenient in that it is accessible from virtually anywhere. m-Learning, like other forms of e-Learning, is also collaborative; sharing is almost instantaneous among everyone using the same content, which leads to the reception of instant feedback and tips. m-Learning also brings strong portability by replacing books and notes with small RAMs, filled with tailored learning contents. In addition, it is simple to utilize mobile learning for a more effective and entertaining experience. Arguably, the first instance of mobile learning goes back as far as 1901 when Linguaphone released a series of language lessons on wax cylinders. This was followed up in later years, as technology improved, to cover compact cassette tapes, Eight Track Tapes and CDs. In May 1991, Apple Classrooms of Tomorrow (ACOT), in partnership with Orange Grove Middle School of Tucson, Arizona, used mobile computers connected by wireless networks for the 'Wireless Coyote' project. Universities in Europe and Asia developed and evaluated mobile learning for students. In 2000, companies were upgraded with specialised equipment in three core areas of mobile learning— authoring and publishing, delivery and tracking and content development. On the other hand, tutors commented that it was important to bring new technology into the classroom through m-Learning. Being a more light weight device compared to books and PCs, it is easy and user friendly. But m-Learning needs to be used appropriately, according to the groups of students involved. 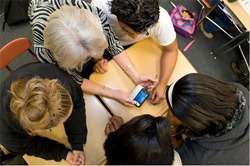 Mobile learning can be a useful add-on tool for students with special needs. It can be used as a 'hook' to re-engage disaffected youth. But this idea May include many technical challenges such as connectivity and battery life, screen and key size, possibilities to meet required bandwidth for nonstop/fast streaming, number of file/asset formats supported by a specific device, content security or copyright issue from authoring group and multiple operating systems. Social and educational challenges include content security or pirating issues, frequent changes in device models/technologies/functionality. Since the mobile learning space is still evolving, there is no industry estimate on the size of the market, as it is too small. m-Learning currently is more about filling information gaps than aid learning. This is because of the lack of affordable high speed smart phones for common man. Once they are in place, there would be little difference between m-Learning and e-Learning. In fact, m-Learning can be an easier and cheaper option than e-Learning because it costs fewer infrastructures, less money and it is more convenient. As per the current scenario, the telecom sector overall is in trouble financially. Right now, private players are more focussed towards rolling out network (3G/BWA) and upgrading activities. Apart from that, due to Mobile Network Portability (MNP), there is issue with keeping quality of existing network. “So when we look at m-Learning for masses, Government will be the key player in promoting the technology for some more time. Telecom operators will then opt out for m-Learning to gain the advantage, but putting onus on private players only and to promote m-Learning at this stage isn't advised” says Deshpande. “May be in 3-5 years, we could look for Public-Private partnership to promote m-Learning” adds he. While Sanjay Vyomkare of Texcelinfotech feels that Govt will take its own sweet time to implement, instead the Private Players should be encouraged and PPP model would help, this would be win-win situation. For m-Learning, apart from tools as mobile one basically needs content which are user need oriented. m-Learning can be useful not only to urbanites but also to farmers in remote villages for various issues like weather updates, education of schools, alerts, health updates etc. Nokia has already tried something similar to educate farmer in India via 'Nokia Life Tool' (NLT) project. This NLT concept provides weather, crop prices and other advices to farmer about their queries. According to the Cellular Operators Association of India, the number of mobile users in India has topped 110 million. Also for its ease of accessibility and lesser cost of establishment, many feel that this can result in information overload. 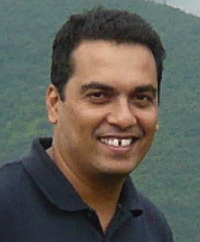 Sanjay Vomkarey of Texcelinfotech feels that information overload is bound to happen. While VP IL&FS Education and Technology Services Ltd says that information overload is everywhere, not just mobile phones. In fact, mobile phones allow one to select information at one's own convenience. Users have the freedom to have access to the kind of information they want. The service differs from one telecom company to the other. There are various kinds of services available like english learning, astrology, weather updates, business tips, stock market etc. The world is moving at such a fast pace that no one has the time to stand back. 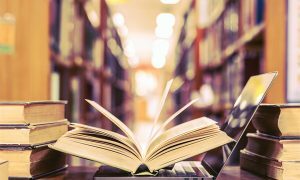 In that case market leaders and experts feel that m-Learning has a great future, especially India, which in course of time, has emerged as a big market with almost 60 per cent young population. m-Learning can help in socio-economic development. All information gaps that prevent the poor from enjoying a good life can be bridged through mobile phones, including the sectors of crop management, government schemes information, financial literacy, job alerts, dial a job, career info and health issues.